"I ordered this martini at a chain restaurant which we don't have in our area when I was visiting family out of town. I tried one, and fell in love with it. So I wrote down the ingredients and starting playing around with the measurements. I found the perfect amount and it tastes even better than the one at the restaurant! I have used Sugar Free Cranberry Juice with this and it has turned out great!" Combine pomegranate juice, cranberry juice, raspberry vodka, orange-flavored liqueur, grenadine syrup, and crushed ice in a shaker. Shake vigorously to chill. Pour into martini glasses, and serve. See how to make a festive, colorful vodka cocktail for the holidays. I'm not a fan. I thought it was much better without the orange liquor, and even then, good but not fabulous. 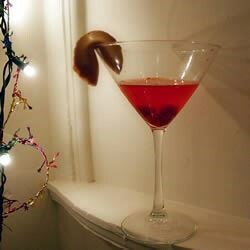 I threw some raspberries into the shaker and garnished with a fortune cookie for a party. So good that we went with hair of the dog for breakfast following. Has a very light, fruity flavor. This was excellent! It was the hit of our Super Bowl party and was just yummy! Sweet and delicious! My roommate (who doesn't drink) even had one. We were afraid that it would be too alcohol-y, but it was perfect!